RF Pattern Matching is now a recognized unique location method in standards that provides carriers and OEMs with the ability to offer high accuracy location-based services that traditionally haven’t been available with low-accuracy Cell-ID based technologies. RF Pattern Matching will be incorporated into Release 10 of the 3G UMTS specifications, expected to become final in late 2010 or early 2011. This will also set the stage for opportunities to incorporate RF Pattern Matching into LTE and other future air interfaces. Polaris WLS™ is a patent-protected implementation of RF Pattern Matching, which provides the best network-based location performance in urban and indoor settings and is a perfect complement to A-GPS, enabling a best-in-class hybrid solution. Polaris’ WLS™ works without the RF Pattern Matching definition in standards, but standardization through 3GPP allows for future performance enhancements and provides flexibility for the solution and carrier implementations. Polaris’s current WLS products will continue to operate within existing standards. By being included in the 3G UMTS standard, Polaris’ location technology has received further validation as one of the most accurate in the world. Polaris will now be considered a preferred provider to Tier 1 carriers and infrastructure vendors who want to add a high accuracy location solution to their technology mix that meets the new 3GPP standard. The FCC is currently considering new E911 Phase II regulations that would improve indoor location capabilities for first responders. Using RF Pattern Matching, Polaris’ WLS™ software solution enables carriers and OEMs to be prepared to meet these new FCC requirements with little or no investment in new infrastructure or hardware. View more presentations from Zahid Ghadialy. Continuing yesterdays theme of Smart Cards. I read Comprion's recent press release with regards to Micro-SIM. As mobile devices get more and more complex, the components used become smaller and smaller. 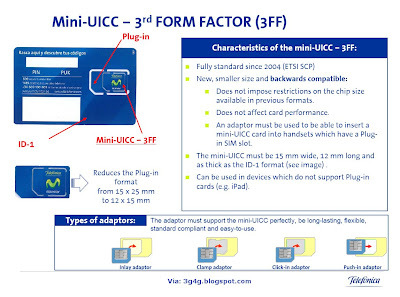 With the launch of the new LTE Test (U)SIM supporting the 3FF format, also known as Micro-SIM or Mini-UICC, COMPRION is responding to this trend. The LTE Test (U)SIM in the Mini-UICC format is only half the size of a regular Plug-In card and can be used in very small mobile devices. Just like COMPRION's first released LTE Test (U)SIM, this new 128K/J LTE Test (U)SIM includes all new LTE data fields up to Release 9. The card has three applications implemented: a Test SIM; a Test USIM; and a Test ISIM. The Test (U)SIM also supports the three voltage classes 1.8V, 3V and 5V. Standardised commands such as "Resize" (for extending the size of a data field) and "Create" (for creating new data fields) are supported. The Test Card's flexibility and feature range enable the user to comprehensively examine the functionality of an LTE mobile device without having access to a live LTE network. To ensure backwards compatibility to the Plug-In format, COMPRION also offers a Mini-UICC Adapter to turn the Mini-UICC into the Plug-In format. Hence, the Mini-UICC can also be used in today's mobile phones. Its interesting to see that the new SIM is around half the size of the original and provides the same functionality. Sign of devices and components evolving. Since the beginning of this year, Sagem Orga and Telefonica have been working on next generation SIM card called SIMFi. With SIMFi, you can convert a phone into a WiFi hotspot. 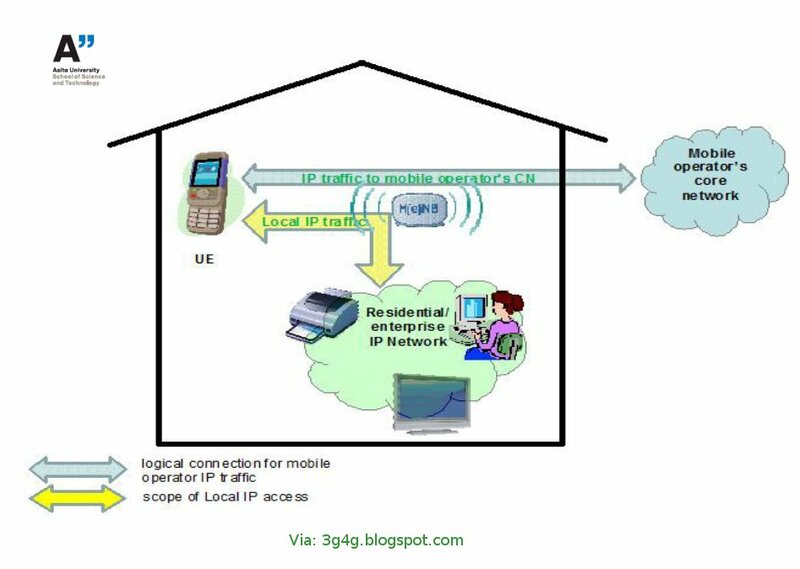 The phone would use HSPA/LTE for data connectivity and at the same time it would broadcast WiFi signals for any equipment to connect to these signals and browse the web. Power consumption information have not been mentioned which I am sure would be a problem for the phone. SIMFi Removes the need for additional accessories to facilitate transmission services (e.g. 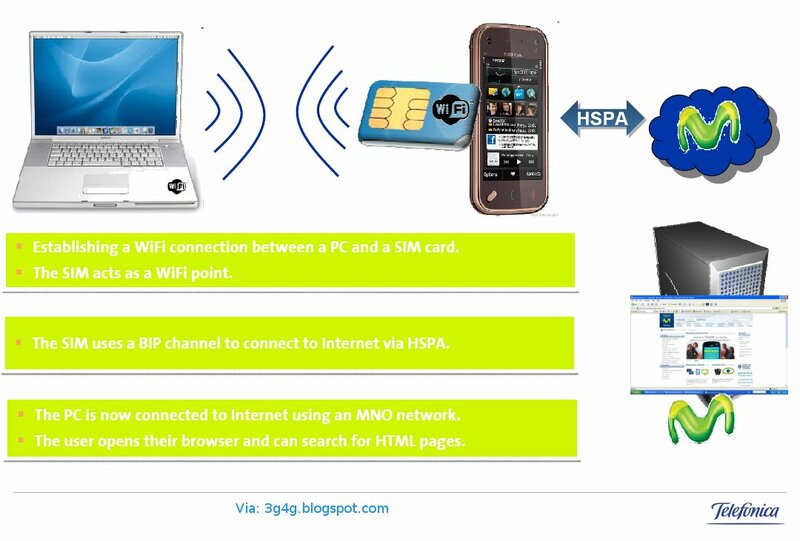 MiFi, USB modem, PCMCIA…) and can make connectivity a lot simpler, straigtforward and cheaper. SIM card compatible with the latest telecom specifications. The mobile phone does not need any special features. Modem WiFi integrated in the SIM card, works with 802.11b. The modem is guided by the SIM card's tools. Energy-saving features (works with 2G and 3G). The aerial is adaptable, allowing short- and long-range operations (from 2 cm to 30 m) managed by the SIM card's tools. An excerpt from presentation by Dr. Doug Pulley, picoChip. The presentation is available to download from here. Since Mozilla Labs launched the Concept Series with an open call for participation we’ve had thousands of people join in, share ideas and develop concepts around Firefox, the Mozilla projects and the Open Web as a whole. In response to our open call Billy May, in early 2009, produced a throw-away concept for an “Open Web Concept Phone”. Working directly off of that community feedback, Billy has since finished the exploration with his concept “Seabird”. The Mozilla Seabird, part of the Mozilla Labs’ Concept Series, is an experiment in how users might interact with their mobile content as devices and technology advances. Drawing on insights culled from the Mozilla community through the project’s blog, a focus quickly developed around frustrating physical interactions. While mobile CPUs, connectivity and development platforms begin approaching that of desktops, the lagging ability to efficiently input information has grown ever more pronounced. Going through my pile of 1 million things to read before I die, I came across this presentation by Tekelec with regards to why Diamater and SIP would be used instead of SS7 in LTE and IMS. The slide in the picture above shows the comparison of SS7 and Diamater. More and more operators are asking for replacement of SS7 with the Diamater interface. The main reason being that it has been adopted by 3GPP and when we move to an all IP network as in case of LTE it makes sense to have Diamater instead of SS7. There is a good description of Diameter on Wikipedia (cant guarantee the accuracy though) here. You can read more about SIP at the Tekelec blog here. View more documents from All About 4G. Once upon a time the Mobile Operators had loads of bandwidth and not enough data users. So they decided to lure the poor users into buying the 'unlimited' data plans. They were sure that the devices are quite rubbish and no one can use enough data. Just for the precaution some clever operators added a small print where unlimited meant 1 or 2GB. The operators thought that the users will never reach this amount. Then came the iPhone and changed the whole world. People actually started using the data on their devices. The operators started panicking. Android just compunded this problem. So the operators now have started advocating against these unlimited plans. The CEO of Vodafone , Vittorio Colao , has told attendees at this year's Nokia World 2010 event that he welcomes the end of "unlimited" Mobile Broadband data plans. Colao also warned consumers that "data pricing has to adjust", thus signalling a greater focus on tiered pricing models. He added: "The principle here must be that, a bit like motorways or hotels, every class of service needs to have its own price and customers must be able to pay for the level of service [they want]. Pricing should be adjusted to reflect the usage and load. We are approaching the end of the free era." The cowboy salesmen are still fooling the average Joe when it comes to unlimited plans. People sue the operators but dont succeed. We are begging to see the return of those bad old days when WiFi was the only option in conferences, etc and they were really expensive. Now instead of WiFi we have got our dongles that may not work well anyway inside the conferences or hotels due to the structure or location but when they do, you again have to think about the costs. In Korea, KT Telecom had to introduce unlimited plans because the other rival introduced one. This is probably because they still have spare bandwith available. Once that gets used up then they will either be running for caps or advocating against the unlimited plans. I have been against the unlimited plans from the beginning but I advocate that the operators become a bit wise in the way they charge us, the end users. If I have 4 devices I dont want limited data on all devices because I dont want to keep track of which devices use how much data or have an allowance. Maybe what I need is a data bundle that I can use across devices and maybe share with my family members. Wallmart has recently come up with something similar in US. Wallmart is a MVNO using T-Mobile network. Though their data plans are expensive compared to T-Mobiles plans just because they allow data sharing and rollover, people may go for them. Rollovers are available on Pay as you go plans but not on Pay monthly which makes the pay monthly (generally on contract) people seem stupid. Operators should encourage this, maybe keep a maximum that can be rolled over. Finally, there is this net neutrality and QoS discussions are going on. Eventually some kind of QoS or destination based speeds, etc will come but for the end user they will go where they will get what they want. The operators should remember this. 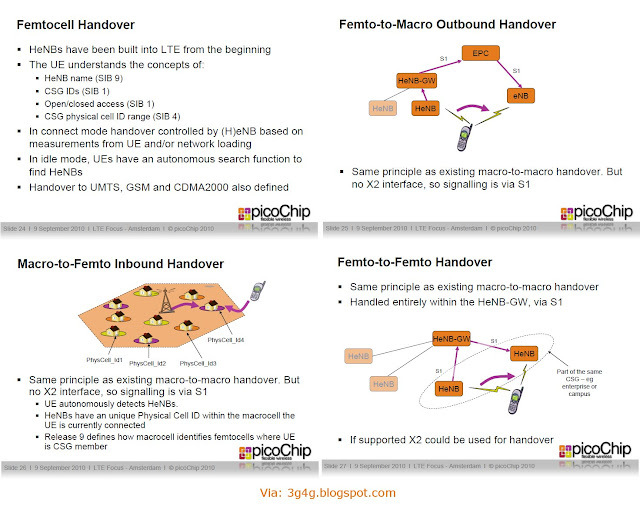 Couple of years back we blogged about the Femtocell Inteference in Macro network. Since then things have moved on a long way. There are commercial rollouts happening with Vodafone leading the way. Yesterday, I was reading Prof. Simon Saunders article on Femtocell and the following struck me. A major technical challenge that femtocell designers initially faced was the need to manage potential interference. It takes up to two years to install conventional base stations, during which time radio engineers meticulously plan a station’s position and radio characteristics to avoid interference. However, such an approach is not viable in the case of femtocells, deployed potentially in their millions at random. Automating a process conducted by radio engineers was no mean feat and simply would not have been possible a few years ago. Fortunately, the fact that the walls of buildings keep 3G signals out and keep the femtocell’s signals in provides strong inherent interference mitigation for indoor femtocells. Extensive studies have shown that proper implementation of a few key techniques to reduce interference can take advantage of this attenuation in an intelligent manner. Such techniques include frequent monitoring of the cell’s surrounding radio environment combined with adaptive power control. Indoor users gain faster data rates, as do outdoor users who now operate on less congested cells, while it costs less for operators to deliver higher overall network capacity. Large-scale, real-world deployments are demonstrating that these techniques work in practice and even allow new approaches, such as operating 3G networks in the same spectrum as 2G networks. 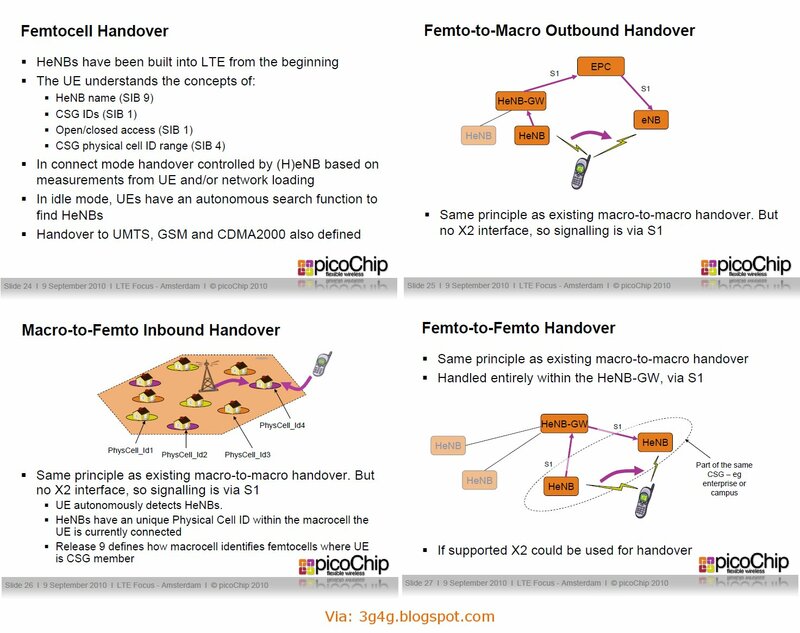 AT&T has deployed femtocells on the same frequencies as both the hopping channels for GSM macrocells and with UMTS macrocells. They have tested thousands of femtocells, and found that the mitigation techniques implemented successfully minimise and avoid interference. The more femtocells are deployed, the more uplink interference is reduced. It is very interesting to see that the interference is not causing any problems in real life. 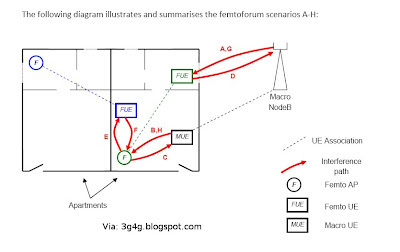 Back in Feb, Femto Forum released a new report on "Interference Management in UMTS Femtocells". A similar report was released in Dec. 08. Then in March they released a similar report for OFDMA (covering both LTE and WiMAX) femtocells. They are interesting reading for those who are interested in this area. System-level evaluation and hardware demonstrator of the proposed femto-based network architecture. 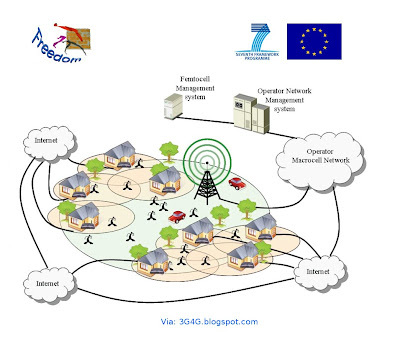 More info on their website (http://www.ict-freedom.eu/). 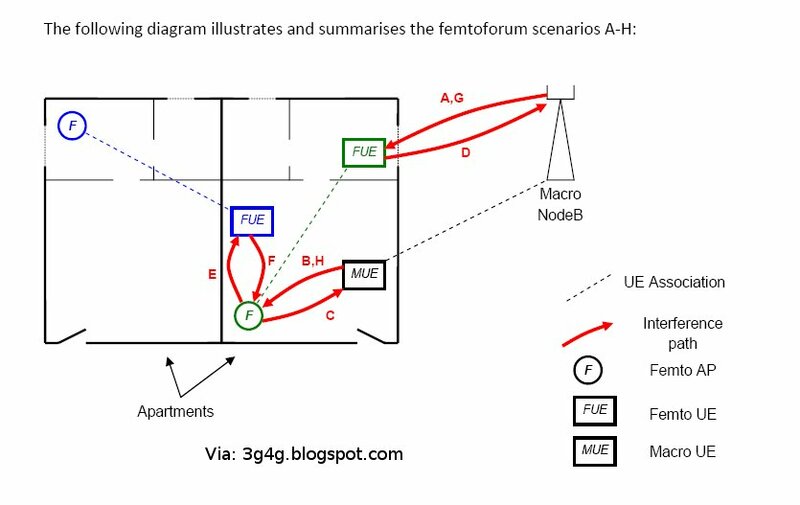 You can see their scenario document that shows different interference scenarios and also compares different approaches including those of Femto Forum, 3GPP and WiMAX. The industry is developing a new standard called Selected IP Traffic Offload (SIPTO). 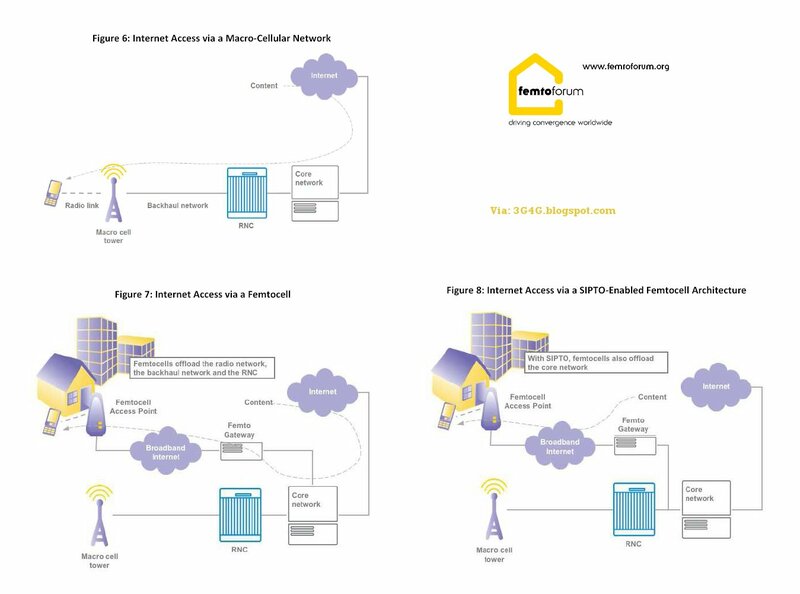 SIPTO allows internet traffic to flow from the femtocell directly to the internet, bypassing the operator’s core network, as shown in Figure 8 below. 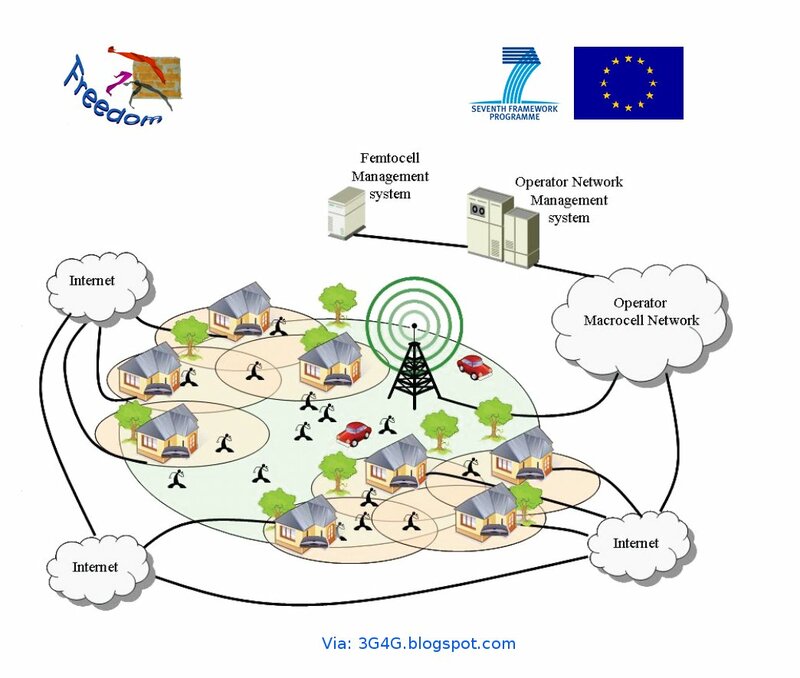 I blogged about data offload earlier, for Femtocells. This traffic offload can be done via a feature called Local IP Access (LIPA). If you have LIPA support in your Home NodeB (HNB) or Home eNodeB (HeNB) then once you have camped on your Femtocell then you can access your local network as well as the network's IP network. This would mean that you can directly print from your mobile to the local printer or access other PC's on your LAN. Note that I am also referring to access via Dongle as Mobile access though in practice I dont see much point of people just using dongles when they are in their Home Zone. Every laptop/notebook/netbook is now Wifi enabled so this situation doesnt benefit much for the dongle access. I am sure there are quite a few unresolved issues with regards to the Security of the data, the IP address allocation, QoS, etc. Continuous computing have a white paper on LIPA available that can be obtained by registering here. Anyway, enough information is available even without getting the PDF. There is also a small presentation here that gives a bit of idea on LIPA. As usual any comments, insights and references welcome. View more presentations from PARR PresentationDesign. The WPC has chosen the Qi logo as the international symbol of wireless charging compatibility. Qi—pronounced “chee”, meaning “vital energy” in Asian philosophy—represents an intangible flow of power. Qi is the sign of interoperability between power transmitters and power receivers. All Qi receivers will work with any Qi transmitter. Every electronic device bearing the Qi symbol can be charged on any charging pad or surface marked with the same Qi logo. In a post last year I mentioned about the wireless chargers. There were few that were released but they are expensive and not sure about the reliability. 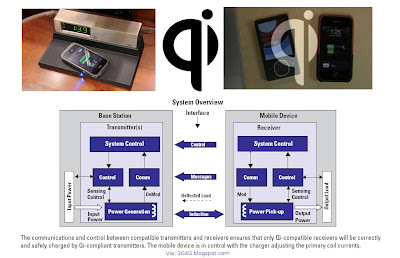 The Wireless Power Consortium (WPC) has launched version 1.0 of its specification for charging handsets and other devices wirelessly, to be marketed under the name “Qi”, and has certified initial products for Blackberry and iPhone devices. The product announcements come a year after the consortium announced version .95 of the spec. The products, including chargers for iPhone and BlackBerry devices, are to be demonstrated at a WPC meeting later this month. Qi is based on inductive power transmission, already used in products such as the Touchstone charging dock used by the Palm Pre and the charging station for the Wii gaming console remote control. Such chargers allow a device to charge when placed on a flat surface or in a sleeve or dock. They eliminate the need for the connection of a metal contact connection, such as is found in standard cordless phone chargers. The consortium, which includes Samsung, Sanyo, Olympus, Philips and Texas Instruments, aims to standardise inductive power charging technology so that chargers can be used with any device bearing the Qi logo. The specification is suitable for devices using up to 5 Watts of power, which the WPC said should cover “the majority of handheld mobile devices”. “Qi can now be integrated into products. All ingredients for growing the market are now on the table,” said WPC chair Menno Treffers, in a statement. Initial Qi-certified products are to include a charging sleeve for the iPhone 3GS and 3G and a charger for the Blackberry Curve 8900, both to be launched by Energizer this autumn. Sanyo, ST-Ericsson, National Semiconductor and others said they are working on Qi products. Prototypes are to be demonstrated at a WPC meeting in Eindhoven, Belgium, from 15 to 16 September. The WPC said it has now begun work on a wireless charging specification for devices requiring more power, including netbooks, laptops, tablet computers and power tools. The consortium said it chose the brand Qi (pronounced “chee”) to refer to the concept of energy flow in traditional Chinese medicine, not the cult quiz show QI (for “quite interesting”) hosted by Stephen Fry on British TV. "It took us only 18 months to develop the Qi standard, and less than one month to see the first products certified. Qi is now the industry's choice for wireless power," said Menno Treffers, chairman of the WPC, in a statement. Three sets of specifications — for interface definition, performance requirements and test procedure — were handed over to consortium members in July. The only standard released publicly as Qi 1.0 is the interface definition, with the others being restricted to consortium members. The WPC has grown from 27 members in July to over 55 members, including Nokia, LG, Research In Motion, Duracell, Energiser and Texas Instruments. Wireless charging has great potential to make charging easier for consumers", said Petri Vuori, Nokia's director of mobile solutions research, in the WPC announcement statement. "For full user benefit, a standard ensuring cross-compatibility between different manufacturers' products is required. Qi low-power standard specification release 1.0 is a significant milestone into this direction." 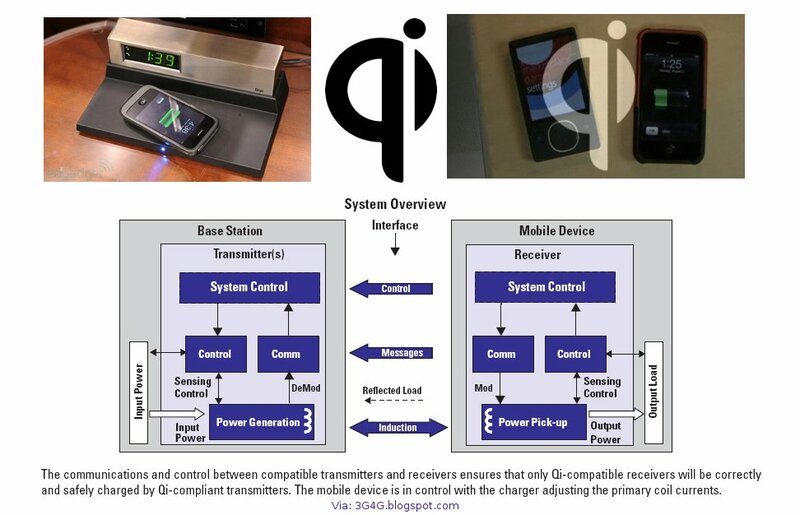 The Qi standard uses inductive charging to transfer up to 5W of power between devices and chargers. There are already products on the market that support inductive charging, but these are tied to particular products, rather than being universal. The WPC said that it now plans to begin work on a wireless power standard for medium power devices such as netbooks, laptops, tablet computers and power tools. The group expects the technology to boost the market for wireless battery charging from 100,000 units to 100,000,000 units annually. "Qi can now be integrated into products. All ingredients for growing the market are now on the table." said Treffers. View more presentations from Kuncoro Wastuwibowo. There are so many news, etc which are worth sharing but don't deserve a separate post so I am going to tweet them. You are most welcome to follow me on twitter or alternatively a widget displaying the latest tweets are on the left hand side of this blog. Please feel free to check them out and feel free to share your feedback or opinions.